The hurricane season is upon us, and in eastern Florida, the season will last through the end of November. With the season lasting half the year, that’s a lot of potential damage your roof can incur. Because of that, we at The Roofing Authority in Fort Pierce want to make sure you’re covered. Contact us now to go over inspection, maintenance, and for repairs before bad weather strikes. We also install brand new roofs of many styles, not only giving you a new element of beauty to your home, but a strong, guaranteed shelter over your head for years to come. The NOAA has predicted a higher-than-average hurricane season for 2017. Up to 17 storms are predicted, nine of which could become hurricanes, and up to four that could become major hurricanes. Be prepared. 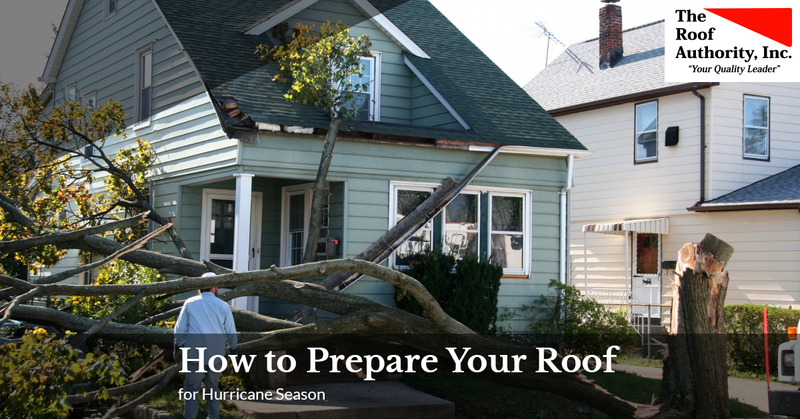 Read on for more tips to protect and prepare your roof for the upcoming hurricane season. Call The Roofing Authority to do an inspection of your roof ahead of time. We will look for any shingles that are loose or missing, cracks, holes, damage, and any other structural issues. While you might not have noticed these issues before the weather takes a turn, they will surely become an issue when even a Category 2 or 3 hurricane is unleashed. Small issues can turn into big issues when water, debris, animals, and other problems find their way inside your structure, instead of staying on the outside where they should be. By inspecting your roof ahead of time, we can take small steps to prevent bigger issues before they begin. Hurricane straps, or gable ends, can help your roof remain intact during hurricane-force weather. These are hardware that should be professionally installed for best results, and add an extra element of strength to your roof when winds reach 100 mph or more. They prevent the roof from shifting, which could reduce the damage to your home. Additionally, some insurance companies offer a discount on rates when they’re installed. While it’s best to have them installed when a structure is under construction, adding them retroactively can be done, and we can help. Trees that provide shelter and shade during gorgeous Florida weather can quickly become dangerous or even deadly during hurricane season. Be sure to have a professional landscaper come by to trim problem spots on the trees, and to be sure no heavy branches exist over the top of the roof, which could fall and severely damage your roof. Occasionally, a roof’s integrity is so far gone that to fix it would cost nearly as much as a new roof. In this case, you’ll need to have a new roof installed. The Roof Authority uses the most cutting edge technology called The Edge, which is a computerized estimating system. We also utilize in-house crane services, weather tracking systems, and only the best materials and craftsman in the installation of your new roof. Whether you need to have a pre-storm inspection, trusses installed, or an entirely new roof, we can help. In the event that you’ve been hit by a storm and need emergency repairs, The Roof Authority has a 24-hour rapid response team to ensure you’re covered. We’ve been in business since 1992, are licensed, bonded, and insured, and guarantee our work. Contact us today for a free estimate.